Let’s look at some of the differences from previous years. The completion percentage is a touch higher than last year, and a few ticks higher than 2015. His touchdowns have also steadily risen over the years, while his interception total of 5 is crazy good. One big change is in the yardage: it’s almost 400 more yards than last year, and 640 more than 2015. As a result, the YPC and YPA numbers have seen huge jumps. Last year, Baker finished the season with an 11.08 YPA line; that number was good for second all time (Michael Vick holds the record from 1999 at 11.35). His current 11.76 would be a huge jump from that. There have only been three seasons with a YPA number over 11.0 – Baker could have two of the potential four if he finishes above that mark. Finally, the passer rating. Last year, Mayfield broke the previous record for single season passing efficiency rating, set by Russell Wilson at 191.78, by almost five points, finishing with a 196.39. This year, he’s beating that mark by 7 points. That would be a truly remarkable finish. 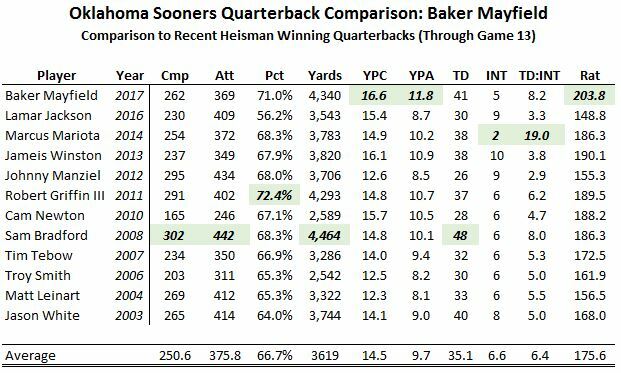 As shown above, Mayfield holds up remarkably well against previous Sooner quarterbacks. (Also, Good Lord did Landry Jones throw the ball a lot). Mayfield matches up like a champ against those numbers. He doesn’t throw the ball as often as some (thank you very much to OU’s running back stable). As such, his completions, attempts, and touchdown numbers aren’t quite as high as some of the others. When he does throw, however, his efficiency is through the roof. Baker Mayfield is having one of the single greatest quarterback seasons of all time. But it’s not just this season; he’s had a spectacular career. If his current pace keeps up, Baker Mayfield will have the two highest passing efficiency ratings over a season in history. Not only that, but he is currently on pace to break the passing efficiency rating over a career (a record currently held by OU’s own Sam Bradford). Bradford’s mark is 175.62 – Mayfield is currently at 176.03. Mayfield also sits at 3rd place on the career passing yards per attempt list at 9.79. It would take some pretty long passes to reach 1st, but second is certainly within reach. Another category Mayfield is dominating is total yards per play. Last year, Baker finished at 9.5 total yards per play. That ypp number was good for 2nd-highest ever in a single season. His current number this year, 10.24 ypp, would blow away the all time record of 9.64 ypp. All of these stats don’t even encompass his impact either. Mayfield is 34-5 at OU. He’s never lost a true road game. He is the Heisman front-runner. He’s joining some elite company by being a Heisman finalist.